The Properties dialog is the place to add useful information about your family tree file. Write a short description of the file and if needed add a copyright notice. You can also specify the primary person in the tree. If your family has a family crest, you can add the family crest here. 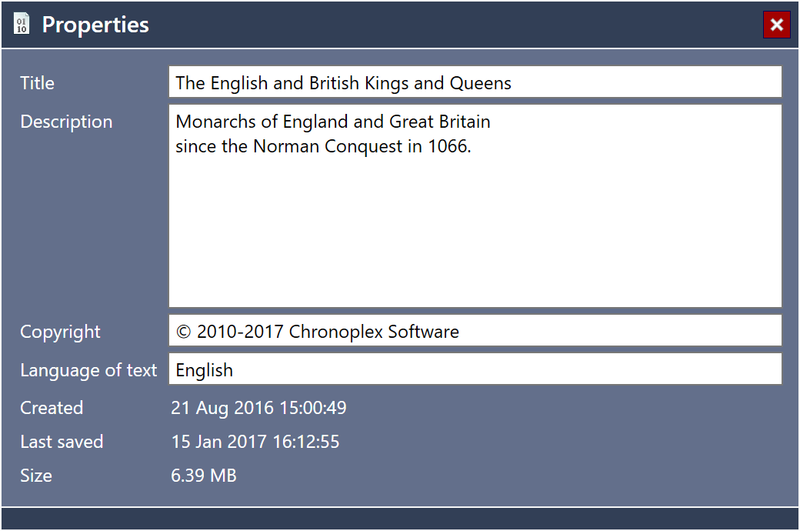 File properties such as the created data and last saved date are also shown. Fig 1. The Properties dialog. The title of your family can be edited here. It is displayed in the summary panel and is used as the default title of many print outs and web reports. The primary person is the person who is shown by default when the file is loaded. Type a name to search and select the primary person or click to remove them. You can disable this behaviour in Options and choose to focus the tree on the last viewed person instead. If your family has a family crest or family coat of arms, you can add or edit it here. Simply click to browse and add one or right click an existing crest to change or remove it. The family crest is displayed in the summary panel and can optionally be displayed on print outs and reports.